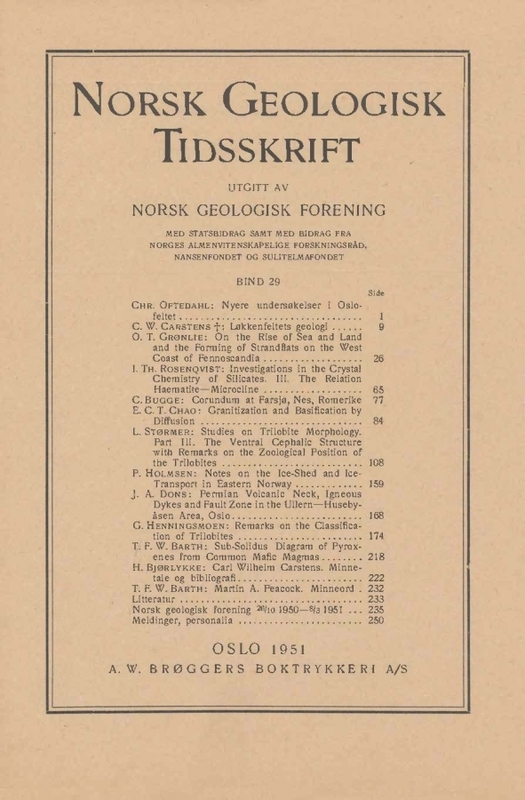 In late autumn 1949 a spedmen of a mineral from Årnes at Nes in Romerike was brought to the Geological Survey of Norway (Norges geologiske undersøkelse). The mineral proved to be corundum. The name of the finder is Andreas Martinsen. He had a pocket full of hexagonal tabular to prism-formed crystals. Most of them were about 2 cm in diameter and about 5 mm thick. The dimensions vary such that the largest diameter among the specimens brought are about 4 cm and many were 1.6 to 1.8 cm thick. The colour is brown with yellow shades. The hardness varies somewhat. Glass can be scratched, but some of the tables could be scratched with knife, which may be due to metamorphism in to gibbsite, (hydrargillite). Determination of the refraction confirmed our assumption that the mineral was corundum.